Marx is often remembered as a political economist or philosopher. But he made his mark as a journalist. Political economist. Philosopher. Journalist? Two hundred years after his birth, Marx is remembered as many things — but not often as a member of the Fourth Estate. James Ledbetter sees that as a mistake. The editor of a 2008 volume of Marx’s journalism called Dispatches for the New York Tribune, Ledbetter makes the provocative case that we should see Marx as a journalist first and foremost. In the following interview, conducted by Steven Sherman shortly after the book’s release, Ledbetter discusses the content and significance of Marx’s long journalism career. Perhaps the most surprising thing about these writings is that Marx was published in a US newspaper. How did Marx come into his journalism phase? Marx was a journalist more or less all of his adult life. He started writing for the Rheinische Zeitung in 1842, and founded his own paper in 1848. His work for the Tribune came about because he’d met an American newspaper editor, Charles Dana (who would later go on to edit the New York Sun) in Cologne in 1848, and a few years later Dana asked Marx to contribute some articles to the New York Tribune on the situation in Germany. I think that Marx and Engels viewed the Tribune as a way to publicize their views and to influence debate with a large number of readers; it must also be said that Marx needed the money. The payments from the Tribune articles were the steadiest form of income Marx ever earned (if you don’t count the constant “loans” from Engels). Can you describe the paper he was published in, the New York Tribune? The New York Tribune was founded in 1841 by Horace Greeley, and it quickly became both the largest newspaper in the world (a circulation of over two hundred thousand during the time that Marx was contributing) as well as the foremost anti-slavery organ in the United States. It featured a number of innovations, including the first regular section of literary reviews, as well as numerous foreign correspondents, including Marx. The paper hit some difficult financial times in the late 1850s, and when the Civil War broke out there was great dissent among its principals about supporting the war and supporting Lincoln (Marx’s editor Dana left during this time). Since Marx was based in London, why didn’t he write for a British paper? He did write somewhat regularly for the British newspaper affiliated with the Chartist movement, the People’s Paper, although as often as not those pieces were adapted versions of material he’d published elsewhere, such as the Tribune. As for the establishment British papers, I don’t think they had much interest in him as a contributor. Was Marx’s status as the author of the Communist Manifesto well known at the time? Do you have any sense of how his writings were received in the US? This translation lag also existed for the vast majority of Marx’s book-length writing. A few American readers who read German would conceivably have known of the Manifesto and Marx’s earlier writing on philosophy, but again, their number would have been very small. Hence, the Karl Marx that most Tribune readers saw had no other reputation to precede him. Can you talk a little about Marx’s approach to journalism? The dispatches that Marx published don’t greatly resemble most of what gets published as journalism today, and in many respects they don’t greatly resemble what was published as Anglo-American journalism in the nineteenth century, either. That is to say: they contain essentially nothing that would today be called “reporting”: no firsthand accounts of events, large or small; no interviews with sources, official or otherwise. They are critical essays constructed, as so much of Marx’s work was, out of the research materials available to him in the British Library. This isn’t to say that Marx’s dispatches were not timely. Indeed, he was quite fastidious about making his pieces as up-to-date as possible, including last-minute tidbits he got from personal correspondence or that day’s newspaper (which seems quaintly ironic today, given that the articles traveled by steamship to New York, and thus would typically be published some ten to fifteen days after they were written). But the basic Marx approach to his New York Tribune column was to take an event that was in the news — an election, an uprising, the second Opium War, the outbreak of the American Civil War — and sift through it until he could boil it down to some fundamental questions of politics or economics. And then on those questions he would make his judgment. In this sense, Marx’s journalism does resemble some of the writing that is published today in journals of opinion, and it’s not hard to see a direct line between Marx’s journalistic writing and the kind of tendentious writing on public affairs that characterized much political journalism (especially in Europe) in the twentieth century. A number of the issues covered in the writings collected in the book resonate with those of the contemporary world — questions of free trade, justifications for war, the impact of colonialism. Some of the media outlets mentioned, such as the Economist, are even the same. Furthermore, since Marx of Marxist political movements, one might also say that the political landscape in some ways resembles that of the present, i.e., many spots of unrest and conflict, rather than a disciplined, readily identifiable movement marching forward or retreating. Can you talk a little about how he saw the free trade question? Britain’s wars with China? Unrest in Europe? The impact of colonialism and resistance in India? “Free trade” was arguably the most dominant economic ideology in Europe in the first half of the nineteenth century, as Adam Smith’s writing was translated into various languages; as governments began experimenting with tariff reductions; and as a rising bourgeois class asserted its influence economically and politically. Much of Marx’s economic writing during this time was devoted to exposing what he saw as the fallacies of free trade thinking, some of them obvious and some of them hidden. In Marx’s view, capitalism as a whole was destined to fail, and thus the redistribution of wealth created by the adoption of free trade policies was at best a temporary phenomenon, and at worst widened and deepened the effects of poverty in countries and population segments on the losing end of the free trade equation. This perspective greatly influenced his view on Britain’s actions in China and India. In Marx’s view, the opium trade — which greatly ballooned at the end of the eighteenth and beginning of the nineteen century — was necessary to prop up the otherwise shaky British economy. Literally, Marx believed that the British crown (acting with the British East India Company) was forcing the Indians to grow opium and forcing addiction onto the Chinese — all in the name of free trade. As for uprisings, you’ve identified what might charitably be called a “tension” and less charitably be called a “contradiction” in Marx’s writing. The crushing of the 1848 revolution in France and elsewhere was, I would argue, the most politically significant event for Marx in his lifetime, certainly prior to the launch of the First International and the establishment of the Paris Commune in 1871. After 1848, Marx learned the power of counterrevolution, and began to believe that existing systems of government and economy could not be overthrown until a relatively informed and organized proletariat could be mobilized to do so. As became clear with every passing year, in many nations such organization was decades away, if it existed at all. And yet, reading through Marx’s Tribune dispatches, you can’t help but see an urgency, an excitement — almost an impatience — in his portrayals of some insurrections and crises in Europe and India. At times he wrote as if this particular rise in corn prices, or this little dust-up with authorities in Greece, was going to be the spark that would ignite revolution. And it’s not as if one can fault Marx for feeling that way; after all, during this period crowned heads of Europe were toppling and certainly at least liberal revolutions seemed likely in a number of settings. But there are times when his discipline of thought appears to leave him, and he is also prone to the tautology that revolution can only occur when the masses are ready, but we can’t know for certain if the masses are ready until they create a revolution. You note that Marx’s view of the US is somewhat surprising, given the trajectory of Marxism in the twentieth century. Can you elaborate? What was his view of the American civil war and the way it was being covered in the British press? I’m not aware that Marx ever wrote a single essay in which he laid out his complete views of the United States, and so one must infer a bit from the essays he wrote during the Civil War, as well as from certain facts, such as the fact that he signed a letter from the International Workingmen’s Association to Abraham Lincoln, congratulating him on his reelection in 1864. It should also be said that Marx never visited the United States. Nonetheless, it is clear that Marx was attracted to at least two aspects of American life: its lack of a monarchy, and its lack of an established aristocracy. Marx keenly followed politics in America , and believed the founding of the Republican Party and the election of Lincoln to be major, ground-shifting events in American history. His pronounced attacks on the British press coverage of the Civil War stemmed from what he saw as rife hypocrisy on their part. The textile industry was a huge engine of the British economy (it employed Engels, after all), and it depended on cheap cotton from the slave-holding American south. And when the British press criticized Lincoln for either being too radical or not radical enough (a common observation was that the North was not really seeking to abolish slavery, but merely to protect the union, which meant protecting slave-holding rights in those states where they still existed), Marx pounced on the hypocrisy as a mere cover to keep cheap cotton flowing. How do you think exposure to these writings might reshape our understanding of Marx? In a few ways. One is that readers of Marx’s economic and philosophical writings might conclude that Marx was an abstract thinker, concerned primarily with theory and detached from the immediate issues around him. Of course, Marx was more abstract than many, but I think these writings demonstrate that Marx was keenly, passionately engaged in the details — even the minutiae — of public life in the nineteenth century. Indeed, some contemporary observers now argue that Marx’s engagement in journalistic writing significantly affected his broader, book-length work, a line of inquiry I think is worth pursuing. Second: it is common for contemporary Marxists to portray their own line of thought as objective and scientific, and separate from the sentimental, moralizing thinking that motivates liberals and others. There’s something to that, and certainly Marx in other contexts portrayed his own work as akin to scientific method. And yet, if you look through this volume for the most passionate and persuasive writing, you’ll find that it is usually deployed on behalf of a cause that at least outwardly resembles moral imperatives: ending slavery; ending the opium trade and its attendant addiction; giving common people a voice in their governance; and ending poverty. 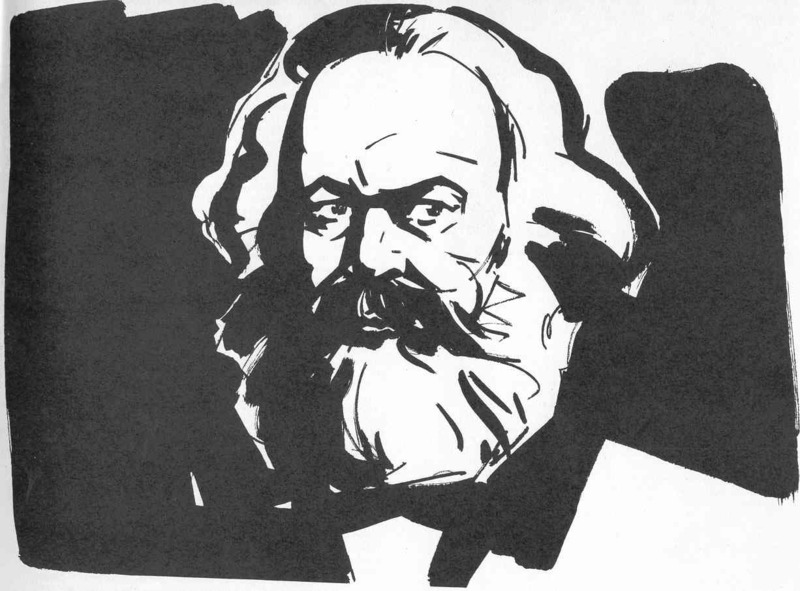 It is not an original observation regarding Marx to say that there is an apparent contradiction between portraying history as the inevitable result of conflicting international forces, and attempting to galvanize people to take history in their own hands — what might be called the determinism fallacy. At a minimum, these writings show Marx was never content to sit back and let history take its course; he felt compelled to persuade, to use the workings of the news cycle as bits of evidence that his world view is the most sound. Which leads to the final point: Marx today is taught as an economic theorist; as a political thinker; and to some degree as a historian and philosopher. Each category is valid; each is also incomplete. The historical record, however, at least suggests another category: that Marx should be thought of as a professional writer, as a journalist. The Penguin Classics volume I’ve edited is but a sample; overall Marx produced, with help from Engels, nearly five hundred articles for the Tribune, which together amass nearly seven volumes of the two men’s fifty-volume collected works. I think we come closer to understanding the importance of rhetoric in Marx’s work if we think of him as a journalist. James Ledbetter is the editor of Dispatches for the New York Tribune: Selected Journalism of Karl Marx . Steven Sherman is a freelance writer.